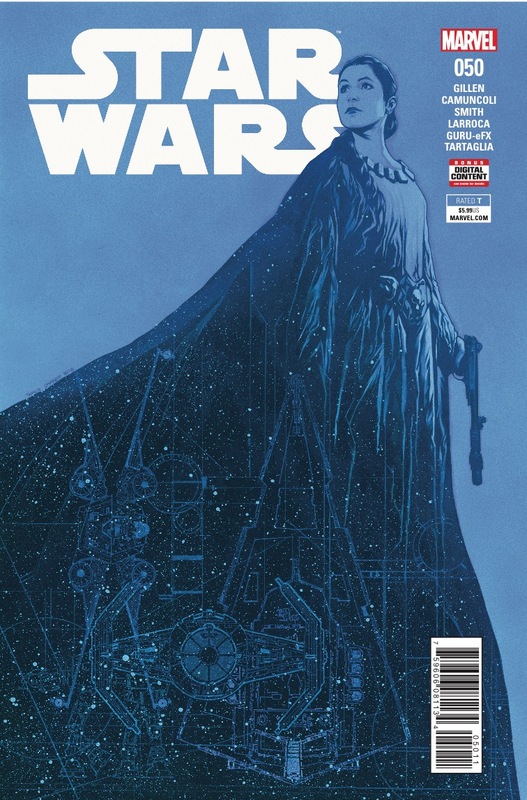 Star Wars #50 Review – AiPT! Celebrate Star Wars with this 50th issue. Star Wars has reached the milestone issue of #50, which is a great feat to say the least. Not every comic reaches 50 issues, but with the help of Jason Aaron, Kieron Gillen, and Salvador Larroca we’re finally here. The story promises key scenes with Leia and Darth Vader, but is it good? Besides this issue being a milestone it’s also a promise to show a direct conflict between the Rebels and the Empire we never knew existed. That means huge space battles, high stakes, and big losses. There are some impressive double page layouts in this book. This is only 1 of two pages. This issue opens with a party near a very large sun. Leia and a bunch of important folks are preparing for a speech and a celebration of a growing fleet. The Rebel Alliance is at its strongest point and they have Leia to thank. 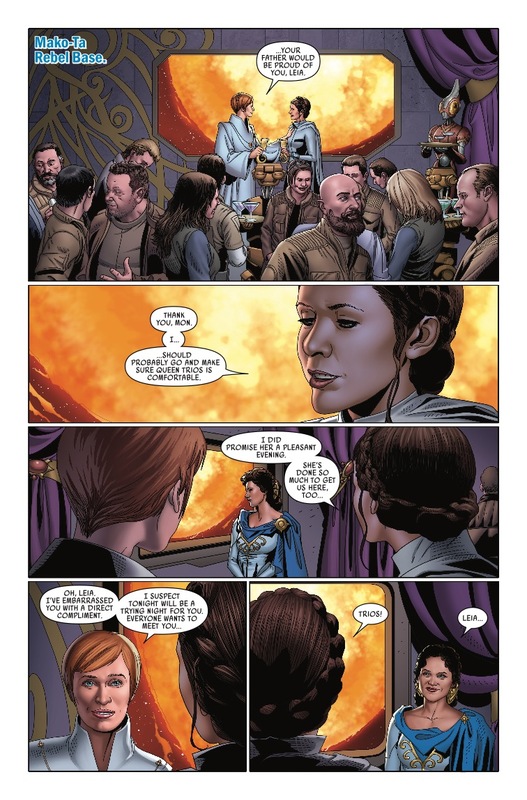 Writer Kieron Gillen does a great job establishing Leia’s humble nature as she insists the Rebels are not the acts of one person but many. As the story progresses we get a check-in with Han and his crew, enjoy some rather impressively sized ships, and get a rude awakening from a certain Star Wars supervillain. 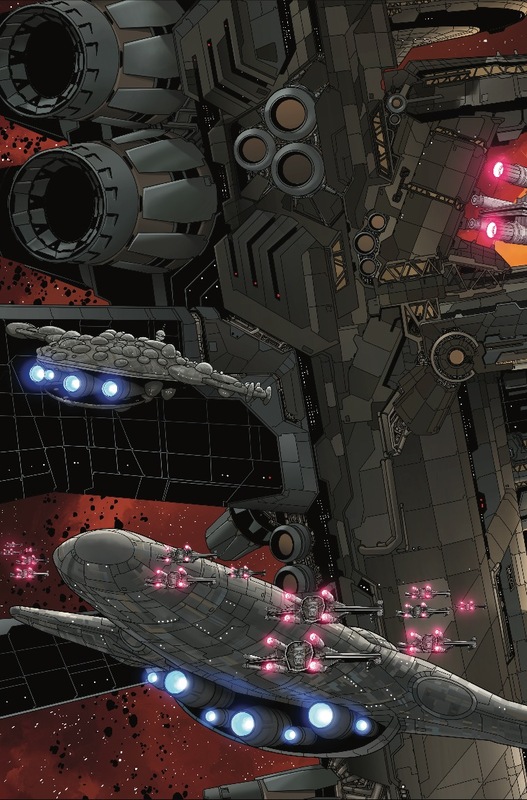 Salvador Larroca draws quite an issue here if you enjoy spaceships and the grandeur of Star Wars technology. There are three double-page spreads showing off the ships in the issue with a double page layout doing the same. His work articulating the spaceships is unparalleled because they look hyper-realistic and he’s very good at making the size of these things quite clear. This issue is a test of patience because it’s so darn slow. It seems to be biding its time to deliver on big moments, stretching out this story arc rather than moving at a good pace. This issue is almost all set up slowly revealing each of our main characters, the purpose of the party, and the eventual turn for the worst. The slow pace may be aided by the double page splash pages which are pretty but don’t progress the story. Added up that’s 6 full pages of art and no story progression. If you love the art and spend time with these pages you’ll probably not notice, but everyone will have to admit by the end the story has barely budged. As is customary with Larroca’s work the likenesses of these characters can be great, awkward, or downright off. There always seems to be the occasional face that is literally traced from the screen and that can be jarring and pull you out of the narrative. He’s drawn so many Star Wars comics up to this point it shouldn’t be a surprise, though. A good setup that takes too long. This issue is borderline infuriating and at the very least boring. I’m intrigued by where it is going, but it takes its damn time to get there. There's a good setup in here somewhere, but it takes ages to get going.